After over sixty years of holding it deep within, an aging American soldier shares his harrowing tale of life and death on Northern Europe’s front lines. Join Recon Sergeant Hobert Winebrenner as he leads you back into World War II. From Utah Beach, through the hedgerows of Normandy, the liberation of France, the Battle of the Bulge, the assault on Germany and the chase in Czechoslovakia, follow in his BOOTPRINTS. Wounded twice and captured once, he saw much in his WALK THROUGH WORLD WAR II. “In what promises to be one of our country’s final World War II memoirs, BOOTPRINTS has saved the best for last. 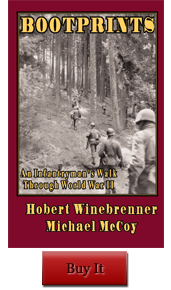 Winebrenner and McCoy walk you through the worst imaginable—life along Northern Europe’s front lines.” – Rick Batholomew, USMC Vietnam Veteran, author of Dig In and publisher of Nam Magazine.